Mark Lamb was elected as the 24th Sheriff of Pinal County on January 1st, 2017. 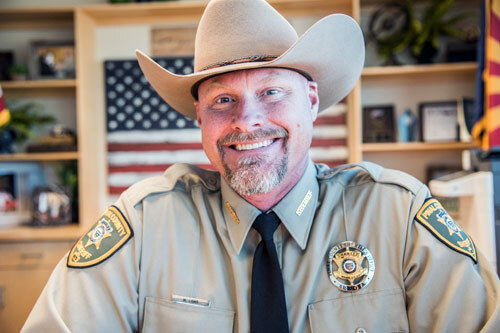 Sheriff Lamb oversees a county the size of Connecticut and manage more than 650 employees within the department. The Sheriff’s Office operates with a 39 million dollar budget which covers all aspects of the Sheriff’s Office to include the Detention Center. The Pinal County Sheriff’s office provides patrol support throughout the county. The PCSO Search and Rescue team, along with the Aviation unit, help with locating anyone lost or stranded and assist with border security operations. The Office also has specialized units, from Narcotics to the Anti-Smuggling Team, to work with our federal partners to combat human and drug trafficking coming through the county from our southern border. The Pinal County Detention center houses on average 600 inmates a day. The Detention Center participates in the Federal Government’s 287g program. Right now we have six detention officers who have 287(g) authority. Through our 287g program in our jail, we have a 48 hour hold to allow ICE agents to take custody of those who have been identified as being in the country illegally. Our primary responsibility is to protect the people of Pinal County. We will continue to support our federal partners in any way that we can to ensure the safety and security of our communities and our citizens. Sheriff Mark Lamb has both experience in law enforcement and the private sector. He trained with the Maricopa County Sheriff’s Office Deputy Academy and was named Valedictorian of his class. He was hired by the Salt River Pima-Maricopa Indian Community, where he excelled as a police officer and was named Rookie of the Year. The following year, he received the Officer of the Year award. He was later promoted as a Detective to the Gang Enforcement Unit and in his first year was named Detective of the Year. The quality of Mark’s work was rewarded by his involvement in a wide variety of law enforcement actions. Mark has participated in DUI task force details and gang suppression, and he has investigated multiple drive-by shootings, drug cases, assault and aggravated assault cases, and homicides. Mark has also worked Federal cases, State cases, and Tribal cases. He later joined the Pinal County Sheriff’s Office as a deputy to better serve his community. His varied background was on full display when Mark was named one of the lead detectives on a multi-agency (Salt River PD, Mesa PD, DPS, ATF, US Marshal Service and the FBI) Federal RICO case that disrupted and dismantled one of the most violent gangs in the East Valley. As a result of this successful case, Mark received the Award of Excellence from the Arizona Gang Investigators Association. As a constitutional conservative, Mark has strong convictions and is courageous in fighting for the citizens he serves. Mark believes strongly in our Republic and our Constitution, he is a strong supporter of our 2nd Amendment rights and the enforcement of all of our laws, including those that pertain to fighting illegal immigration, and he is determined to protect the rights and freedoms of the people whom he serves.